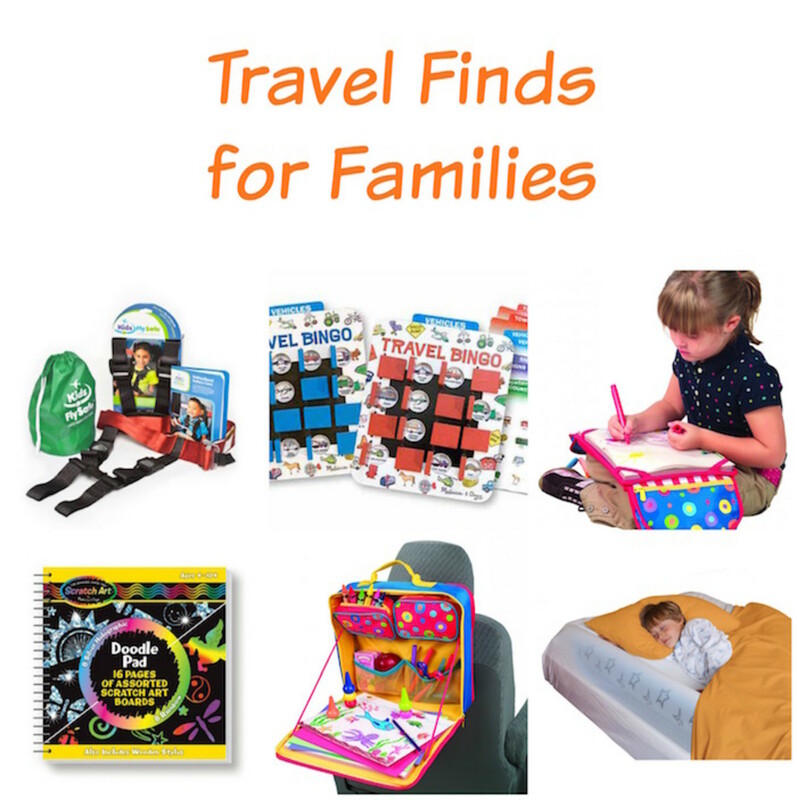 I&apos;m sharing my top travel essentials for kids! We&apos;ll be hopping in our cars (or taxis) and driving to the airport only to sit around for awhile and, then, get in the airplane and sit around some more... To a child getting there is not half the fun, so I&apos;ve rounded up my favorite travel products to make the traveling part of your vacation feel more like part of the vacation itself. So, pack some magazines for your trip, you might get to read them! Before you start the journey, get the kids excited with their very own suitcase. 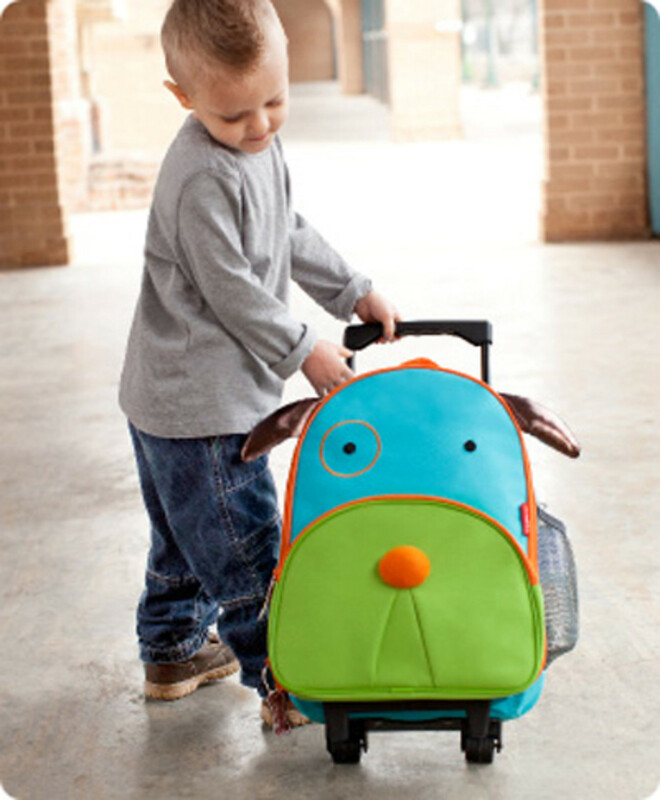 Skip Hop&apos;s new Little Kid Rolling Suitcase is just the right size for all your child&apos;s favorite toys and books and the bag fits right under his seat on the plane. The detachable shoulder straps are adjustable for when the little one is tired of rolling his own suitcase. Okay, you&apos;re on the plane. Now what? The Desk to Go from Alex Toys can be used on airplane tray tables or on the child&apos;s lap.With pockets for art supplies and a notepad, kids can spend their trip coloring and playing with stickers. The Car Valet by Alex Toys is a mini desk filled with fun. This colorful organizer attaches to the back of the front seat in a car. On an airplane, the Car Valet keeps art supplies organized and zips up to an easy to carry suitcase. Travel Bingo by Melissa & Doug is a great option for travel. There are no loose pieces, just theme cards that slip into the game. Cards are stored neatly inside the board. Suitable for ages 4+. Melissa & Doug&apos;s Scratch Art is also really fun for traveling. All you need is the included wooden stylus and this pad of scratchable art. With many themes and styles to choose from. If you&apos;re staying at a hotel or a friend&apos;s house, you might want to bring your own pack and play. The Joovy playyard folds in half and takes up 3.5 square feet of storage space. You can put it next to the wall, behind a door or under the bed and it unsnaps back in seconds. The Ultralight also comes with a 100% cotton sheet and a travel bag. Tots find it comfortable and parents like the sleek look. For more playyards check out our Momtrends Must Haves. If you plan on your child sleeping in a bed, check out our picks for inflatable beds. Some car seats have been approved for air travel (click here for details; they must be no wider than 16″ and must have a special label, etc.). But as any weary plane-traveling mom can attest–these seats are cumbersome. Savvy traveling moms rely on the CARES device. CARES: Child Aviation Restraint Systemfollow works with the plane’s seat belt to keep your child safe and secure. The sample I was sent weighed about a pound and fits into my handbag–try that with a car seat! The instructions are simple. Slip the red belt over/around the seat and the bottom of the restraint works with the airplane’s seat belt. The device won the Good Housekeeping “Good Buys Award”–cool, but I am more impressed with the founder’s story. Grandmom Louise Stoll thought this design up after seeing her daughter struggle with two babies on an airplane. This enterprising granny patented her design and took her idea to AmSafe Aviation, the Phoenix based company that manufactures most of the airplane seat belts in the world and had years of experience working with the FAA. Between AmSafe’s knowledge and Louise’s dedication, CARES garnered FAA approval. CARES is the first and only alternative to a car seat permitted on planes. The certification gives parents the right to use CARES on all US airlines for all phases of flight: taxiing, take off, turbulence and landing.